On arrival at Linear Fisheries I drove around all the lakes to check out any signs of carp movement. I noticed bubbling water in and around pegs one and two on the St Johns lake, however, I couldn’t fish in these swims as they was already had anglers settled in them. I eventually found carp movement on the Brasenose one lake. Towards the windward bank (Easterly Bank side) I seen carp crashing out about 40 yards. There were no anglers in the area, so I thought this would be a great place to target the fish during my stay of 48 hours. All 3 rods was set up by 4pm. I tactics I decided to use was to bait heavily to try to keep fish in the area for the duration of my stay. 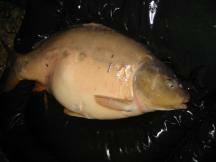 I also know that there are great numbers of carp in the Brasenose lakes, so it is highly unlikely to over-feed the lake. I baited up by spodding in about 8 kilos of particle bait. 6pm: More carp crashing out towards the right side of the baited area. I cast out a rig about 5 feet away from the showing fish and left the rig out for an hour or so. No takes. 8pm: Few line bites on the middle rod which was on the baited area. I believe this is fish taking particle baits that have fallen out during spod casting and landed closer to the bank. I decided to re-cast the rods with a rig set closer to the bank and away from the heavy baited area. No takes for 3 hours. 12am: The left hand rod had a take, and as I struck into the fish it pulled out almost immediately. One lost fish to record. This was definitely a carp, but I believe the rig was wrong for the situation. I decided to try a newly tied bottom bait carp rig using a bigger hook. 2am: All 3 rods set for the night. No takes or movements during the whole night time. 8am: Left hand rod screamed into action just off the sunken island. I played the fish for 15 minutes before landing a 15 pound mirror carp. 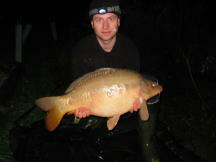 This was caught on Richworth Tutti-fruiti boilies. 1pm: Further carp movements to the right side of my peg, towards the reed beds a carp was topping out 3 times within 20 minutes. I cast a rig out the area but no takes. 6pm: No more movements within the area. Rain started to come down and I believed this would get the fish down for feeding in the rain. 9pm: Another take on left hand rod, again by the sunken island area. An area I didn’t bait up with particles. I placed out a few free offerings using PVA stringers. I pulled into the fish and played it for 10 minutes before landing an 18 pound mirror. 1am: All 3 rods set for the night. No more movements of fish crashing out. Wind has dropped and water all calm. No more takes all during the night. 9am: At this stage in the session it's all too quiet, maybe fish moved out of the area. I decide to pack up and try again within the next month!